Thick and chewy, these one-bowl Snickerdoodle Bars taste just like the classic cookie but in an easy bar form. Raise your hand if you love eating cookies but hate spending the time to make them! 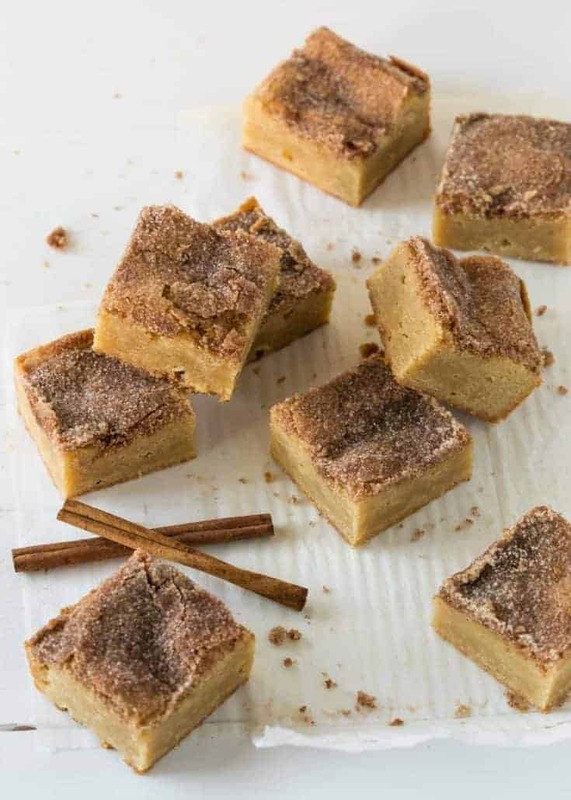 These one-bowl Snickerdoodle Bars give you all of the buttery, cinnamon flavors of your favorite cookies but save time in the kitchen by making them in an easy bar form. These Snickerdoodle Bars are pretty much my definition of a perfect dessert for a group. Thick and chewy, they are filled with our favorite Kerrygold® butter and have a crunchy cinnamon sugar crust on top. Each bite gives you the perfect mouthful of chewy and crunchy all at the same time. And you are able to pop them in the oven in less than 15 minutes. Clean up is a snap and since you don’t have to wait for each pan of cookies to bake, you can move on to the other parts of your party prep and cross dessert off your list. I’m always looking for ways to make hosting parties as easy as I can. 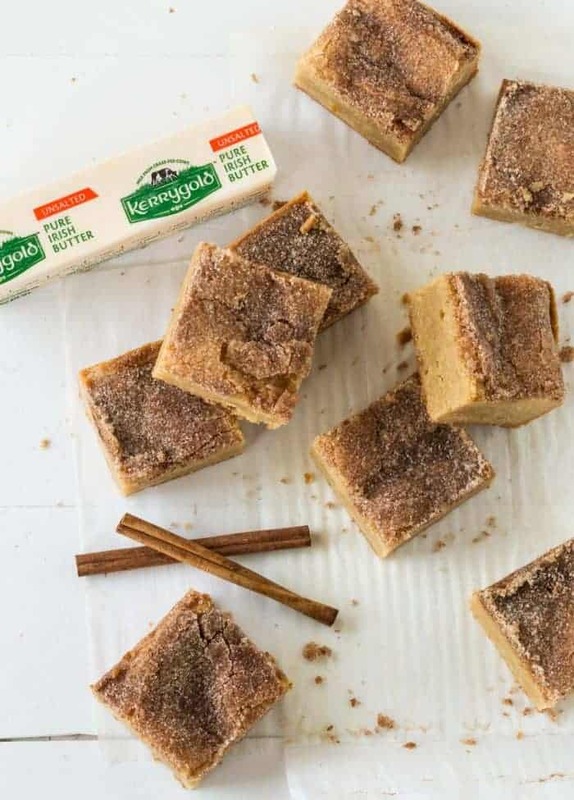 So when I can get party worthy desserts like these Snickerdoodle Bars that are super flavorful without a lot of work, it definitely counts as a dessert win in my book. Tip: Want to cut smaller squares for a larger group? Make these in a 9 x 13 pan and bake for 20-25 minutes. Preheat oven to 350 degrees. Line an 8 x 8 square pan with parchment paper and set aside. In a large bowl combine melted butter, 1 cup granulated sugar and brown sugar and stir until well combined. Add vanilla and eggs one at a time and stir until fully incorporated. Add flour, cornstarch, cream of tartar and salt stir until just combined. Pour batter into prepared pan and spread so it is distributed evenly. In a small bowl combine remaining 1/4 cup granulated sugar and cinnamon and sprinkle over the top of the batter. Bake in preheated oven for 35 minutes or until the bars just start to pull away from the edge and a toothpick comes out clean. Cool completely, slice into squares and serve. Oh dear, this is interesting 🙂 I have bought pure Irish butter two days ago because I have never tasted it before and it is in the fridge waiting….. guess what shall I do with it 🙂 Thank you so much ! I compared this to similar recipes, and think this should be baked in a 9×13 pan, possibly? You can do it in a 9X13 pan but you will have to adjust the baking time. I like them a little thicker so I make mine in an 8 x8. Enjoy!